We’re all big fans of Disney in our house. We watched a lot of Disney television and movies (Toy Story is our favorite here). Just for fun, I decided to create a fun Disney Word Scramble for all the other Disney fans out there. 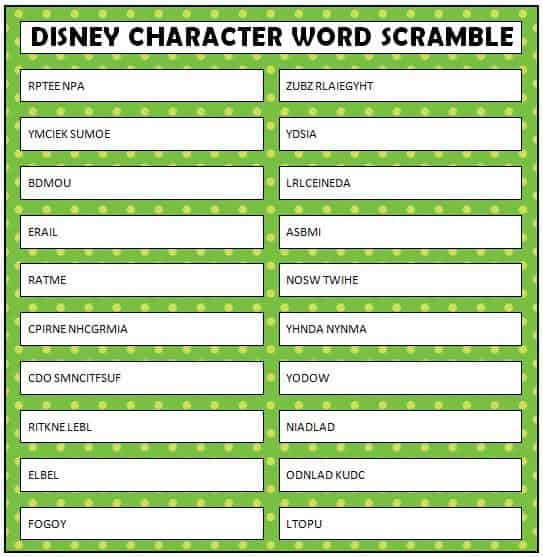 All of the scrambled words are Disney characters – some new and some of the classics. How many can you guess correctly? Let us know how you do in the comments below. What is your favorite Disney movie? Does your little one have a favorite Disney character? If you’re planning a vacation to Disneyland, you’ll want to take a peek over at our page dedicated to Disney fun. On our last family trip to Disneyland, I wrote multiple posts on fun things to do, traveling with a toddler, traveling with a child who has a food allergy and more. We’ll be heading to Walt Disney World soon so I’ll be updating that page with fun Walt Disney World ideas in early 2014. To stay updated on the latest fun ideas, you can join our communities on Facebook, Pinterest and Twitter. We look forward to seeing you there! Disclosure: I’m part of the Disney Junior Mom program and I receive special perks as part of my affiliation with this group. This post is outside of this program. The opinions on this blog are my own. I think my favourite is Beauty and the Beast! My favorite is Lion King. Thanks for sharing this free printable puzzle. Disney is fab!! great printable thanks for sharing! What a fun game for the kids! Snow White jumped out at me right away. My family LOVES Disney! As a child and now an adult my favourite is Beauty & the Beast. However, Tangled and the new Tinkerbell Secret of the wings have come in a close seconds! Thankful I grew up with Disney! Beauty and the Beast and Aladdin were always my favorite. How cool is this! Great idea! 🙂 My fav movie is Lady and the Tramp!